Listen: Just because you can do something doesn't mean you should do it. 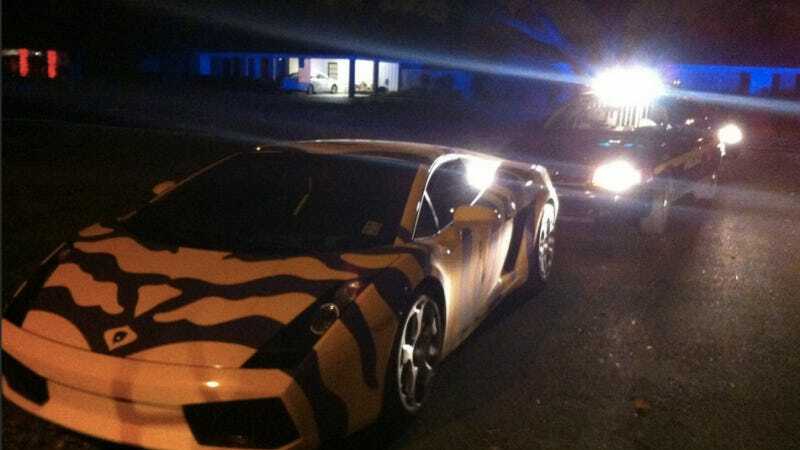 That should be abundantly clear when you see this LSU fan's yellow and purple-striped Lamborghini Gallardo. I think we can all agree that it's deeply offensive to look at, and apparently, these cops in Lafayette, La. thought so too. Reader "Winston Smith" sent us these photos and tells us that this driver was apparently pulled over for speeding, then arrested for unknown reasons. The car was left on the block, presumably to be towed away to some impound lot where it will almost certainly be the most expensive and least tasteful car in police custody. Lots of us are proud of our alma maters, but there is such a thing as going too far, amigo. Geaux Tigers, I guess. Hat tip to Winston Smith!